Saint Clair Family Estate is owned by Neal and Judy Ibbotson, viticulture pioneers in Marlborough since 1978. 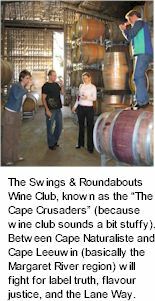 Grapes were originally supplied to local wine companies; however a desire to extend the quality achieved in the vineyard through to the finished wine led to the establishment of Saint Clair Estate Wines. 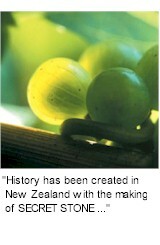 Saint Clair’s viticulture philosophy for quality grapes is simple. 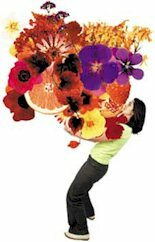 Optimum flavour is achieved by significantly reducing vine stress; obtaining uniformity in vine growth, crop level and ripening; good light exposure, no disease, harvesting at the right time for maximising flavours and adjusting management for seasonal variations. Sally's Paddock is a distinctly Australian winemaking and culinarily focussed estate, named after the small town situated three kilometers to the north, two hours north-west of Melbourne at the heart of the Pyrenees rangea. Sally's Paddock has established a reputation for producing wines of excellent quality, consistency and value. Neill and Sally originally planted the estate to Cabernet Sauvignon, Shiraz, Cabernet Franc, Merlot and Malbec, today there are forty five acres under vine, producing extremely high quality grapes. 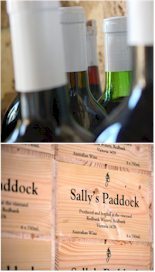 After more than thirty years in the wine business, Sally's Paddock continues to be wholly owned and operated by Neill and Sally Robb. That something special was rich undulating fields in the shadows of Mt Ida at Heathcote in central Victoria. Tony and Linda Hunter's vision was to create a family run boutique vineyard where quality, passion and energy were reflected in the wine. 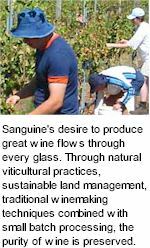 Sanguine Estate vineyard and winery, established in 1997, is located approximately 5km along the Northern Highway from the turn off to Echuca, north of Heathcote. Embraced by children Mark and Jodi and their respective partners Melissa and Brett, the family worked weekends to establish the initial 16 acres that grew rapidly over the following years to 55 acres in 2002. The family's desire to produce great wine flows through every glass. Through natural winemaking techniques combined with small batch processing and hand plunging, the purity and integrity of the wine is enhanced. Sarsfield boasts a bridge, a dozen or so houses and a single street light in the middle. There are no shops, no pub and the school has been closed a few years ago. But of course there is always hope that Sarsfield too, will eventually graduate to a traffic light and perhaps a supermarket! The Gippsland area has been inhabited for at least 18,000 years by people of the Gunai or Kurnai tribe, living as hunters and gatherers in the hills and along the rivers and the coast. (learn more: Bataluk Cultural Trail). 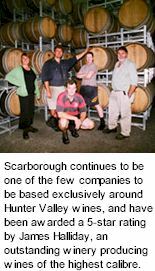 Seabrook Wines is an artisan winemaker who works with growers to source exceptional fruit from the top regions around Australia and make premium wine to sell both domestically and into the international market. The business is family owned and operated out of the Barossa Valley where their estate vineyard and winery is located at the base of Menglers Hill in Tanunda. 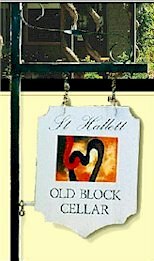 Since their first vintage in 2005 Seabrook wines have been awarded Haliday’s 5 star rating for the winery as well as several wine show medals. 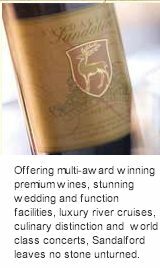 "Made from the 2004 vintage, this wine has been passionately created to reflect the distinctive Sauvignon Blanc style for which the region has become well regarded throughout the world." This began in 1997 when Sonja and Paul Evans saw their land for the first time. Armed with a shovel, sheer dedication and limited resources, Sonja and Paul embarked on an ambitious plan to transform a 50 year old cattle property into a fully operational viticultural enterprise, which now encompasses a 2000 case annual wine production and listings in some of the most exclusive restaurants and wine stores Australia wide. 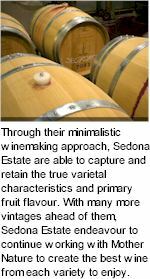 With each new vintage Sedona Estate faces nature’s unpredictable challenges, requiring skills, flexibility and continuous improvement to create the best wine from each variety. From its beginnings in the Barossa Valley in 1851, Seppelt has pioneered vineyard plantings in regions of southern and eastern Australia. Constantly innovating, Seppelt is creating new wine styles, new packaging and new ideas that position this outstanding winery as a world leader. 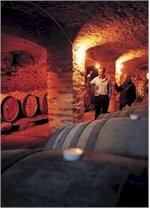 Seppelt's Great Western Winery is famous for The Drives (the labyrinthine catacombs of sparkling cellars) and home to the two champion Shiraz wines, St. Peters of Great Western, and the world-renowned Show Sparkling Shiraz. 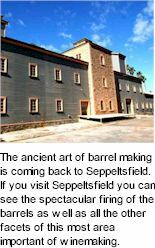 The heart of Seppeltsfield is the unique collection of fortified wines slowly maturing in oak barrels, and dating back in an unbroken line to 1878. Today's Seppeltsfield believe the range to be the most comprehensive of any fortified house in the world, encompassing traditional European fortified styles- principally “port” and “sherry” styles- but with an Australian twist- the grapes used for port style wines are traditionally the same as those which make the great Barossa dry reds- i.e. Shiraz, Grenache and Mataro (Mourvèdre), and a such are quite distinctively different from those made in Portugals’s wonderful Douro Valley. The sentinel stone at the entrance to Seresin Estate signals the path to the winery and herald's the philosophy of the winemakers. The stone bears a subtle handprint, a symbol of the individual, and of creative endeavour. It represents a philosophy to blend tradition with technology, to work with natural elements and elicit a true Marlborough character to the wines. Organically grown, hand-tended, some fermented with wild yeasts, the grapes from the estate are raised on a cornerstone of working in harmony with nature. Complex flavours and sensational palate texture are hallmarks of Seresin. 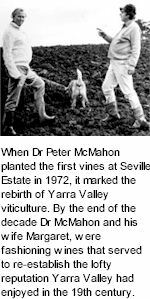 When Dr Peter Mc Mahon planted the first vines at Seville Estate in 1972, it marked the rebirth of the Yarra Valley as a premium wine region. 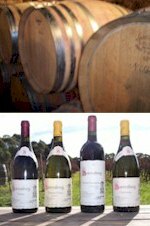 By the end of the decade Dr McMahon and his wife Margaret, along with producers such as Mount Mary, Yeringberg, Yarra Yering, St Huberts and the like were fashioning wines that served to re-establish the lofty reputation the Yarra Valley had enjoyed in the 19th century. From its first vintage, Seville Estate quickly established itself as one of the Yarra Valley’s finest producers. Surprisingly in a region more renowned for its red wines produced from Cabernet and Pinot Noir, it was the Seville Estate Shiraz that received the most attention, quickly becoming one of Victoria’s most sought after wines. 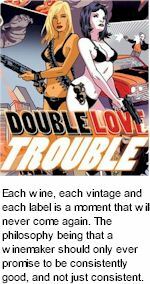 These wines that have been called one of Victoria's best kept secrets are now some of the most stylish on the market, with back vintage tastings showing their superb ageing capacity. 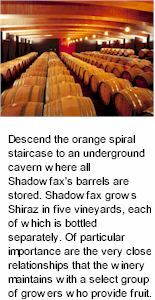 Shadowfax grows Shiraz in five vineyards, each of which is bottled separately. These five vineyards are maintained by dedicated vignerons under the direction of the very talented Chief Winemaker. Of particular importance are the very close relationships that the winery maintains with a select group of growers who provide fruit for the Chardonnay, Sauvignon Blanc, Pinot Gris and Pinot Noir. An innovative and visionary restaurateur, Ross saw the whole wine and tourism scene set to explode. In 1968 Ross gave his friend Colin Preece a free hand to identify the location for his great dream. In 1969, the first vines were planted on the Blackwood Park property at Mitchellstown near Nagambie, on the very site where Major Thomas Mitchell and his Australian Felix expedition had crossed the Goulburn River in 1836, opening the Victorian hinterland for pastoral settlement. 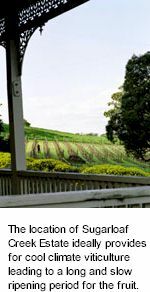 The Yarra Valley has a rich and romantic history as a wine producing region, extending back to 1838 when the first vines were planted by Swiss settlers. By the turn of the century, some 800 acres of prime land had been planted with vines, and the region quickly developed a reputation for producing excellent table wines. Over time, the demand for fashionable fortified wines such as muscat and port increased. 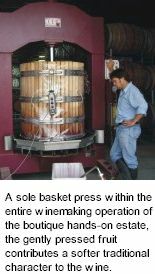 This resulted in many winemakers abandoning their vines, unable to earn a living from their produce. 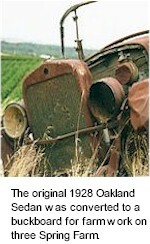 By the early part of the 20th century most vineyards in the Yarra Valley had ceased operating. With the resurgence of interest in wine in the late 1960s and early 70s, more and more vineyards were established in the area with growers planting Shiraz, Chardonnay, Pinot Noir and Cabernet Sauvignon varieties. The Morey family has a tradition of winemaking that goes back over 500 years to the Mosel River in Germany. 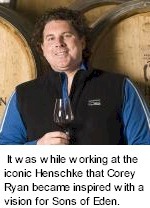 Barry's grandfather, Jacob Barzen, emigrated to Australia to work on a family vineyard and winery at Dookie. This vineyard has since been sold and converted back to grazing land. The name Sorrenberg comes from a small vineyard owned by the Barzen family near a town called Reil on the Mosel. Yarra Valley was the region of choice, for its acclaim in producing cool climate, clear varietal wines with savoury elegance. 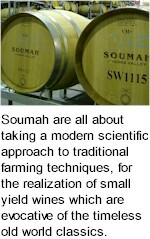 The Soumah raison d�etre is to support this fame with the definitive vineyard site, nurturing viticulture and a focus on quality over quantity. 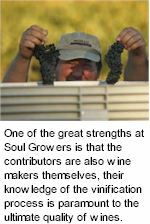 The viticultural team focus on the crucible of the wine grape. Over the centuries, the noble grape varietals of the old world traveled back and forth across Europe. Viognier is a distant cousin of Nebbiolo, Savarro began its history in Bolzano but is today found in France. Pinot Gris and Pinot Noir are found in France and Italy, albeit under different styles. 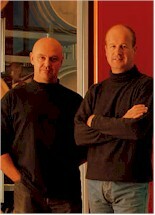 Philip Jones and Sheryl Jones established the winery in 1990. 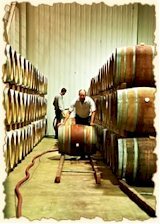 Philip is a graduate of the University of California with degrees in Viticulture and Integrated Pest Management. 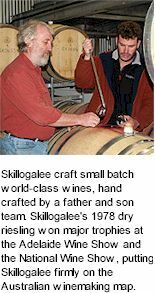 He worked for eighteen years as a consultant to the Agricultural industry and during this period trained as a Winemaker at California State University. His experience as both a Winemaker and Viticulturalist contribute greatly to the winery direction and success. 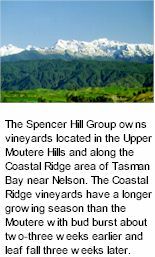 After investigating viticultural areas throughout New Zealand it was decided to establish vineyards and a winery in the Upper Moutere hills close to Nelson. 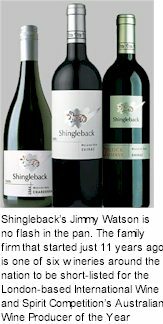 The first wines were produced in 1994 under the Tasman Bay label and were quickly recognized as some of New Zealand best wines. The cradle of quality for Squawking Magpie is the Woodlands Vineyard in the Gimblett Gravels area, the first 4 hectares of which were planted in 1995. In 2002, a new 20 hectare vineyard was developed as a joint venture and planted predominantly in Cabernet Sauvignon, Merlot and Syrah. A true visionary and a man of great intellect, Hugo Gramp was a linguist, businessman and expert winemaker who felt a great sense of connection with Australian terroir, which he proved to the world, could create internationally acclaimed, award winning fine wines. The modern iteration of St Hugo was launched with the 1980 vintage to honour Hugo Gramp, the grandson of Johann Gramp who planted his first vines in the Barossa Valley in 1847. 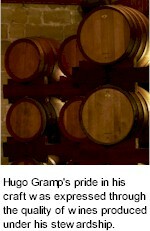 Hugo Gramp succeeded his father at the head of the Gramp & Sons family business, at the age of 25. Hugo's leadership and passion for wine set the company on a path of extraordinary growth. St. John’s Road has been resurrected. 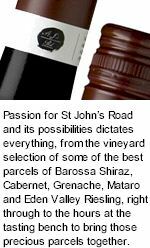 Purchased by Adelaide wine identity, Alister Mibus and some friends, including talented winemaker Kim Jackson, Barossa label St John’s Road has been revitalised in every sense of the word. Inspired by the wonderfully rich heritage of the Barossa Valley, St John’s Road has been brought to life by the places, personalities and tales of this great region. The quirky new packaging embraces this tale through fresh eyes. While winemaking consistency has been maintained by established winemaker Peter Schell, St John’s Road winemaker since 2005, Kim Johnston, talented winemaker of Henry’s Drive and Shirvington, now joins Peter in the winemaking team. In 1864 together with his son John Lewis Stanton, Timothy purchased land at Rutherglen in North East Victoria immediately establishing a farm and vineyard. By 1875 the Stantons were well established as successful Rutherglen vignerons. 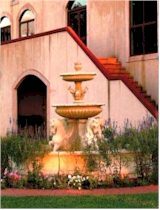 Timothy's grandson John Richard Stanton continued to improve and expand the business and by the 1920s had established the magnificent Park View vineyard and winery. 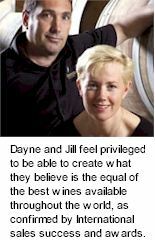 Brett Barnes is the viticulturalist and Liz Barnes is the winemaker. Rick Kinzbrunner from Giaconda Winery has assisted Liz in the making of the wine since the establishment of the winery commencing with the 2005 vintage. 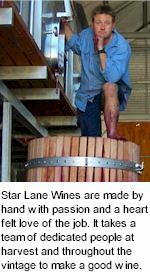 Rick has kindly imparted wisdom and knowledge along with a few trade secrets to help create Star Lane’s wines into wines with elegance, finesse and distinction. The fruit is all estate grown. 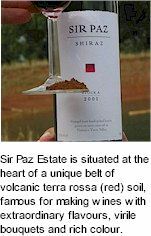 Merlot and Shiraz are planted on red loam over mudstone soils. There is also a planting of Sangiovese and Nebbiolo on granite soil at partners Kate and Rex Lucas’s place just a couple of kilometres away. The vineyards are slightly sloping with views stretching across the hills that encircle them in the valley to which they are planted. Overlooking the spectacular tidal estuary of the Derwent River at Granton, 20 km’s north of Hobart, Stefano Lubiana Wines remains a family owned and operated business, focused on producing small quantities of hand crafted, cool climate, Tasmanian wines. First planted to the Burgundy varieties of Chardonnay and Pinot Noir during the spring of 1991, the vineyard has expanded over the years to its current area of 18 hectares of closely spaced vines. Plantings also comprise of Merlot, Sauvignon Blanc, Pinot Grigio, Riesling and Nebbiolo. 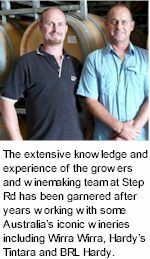 Step Rd was established in 1985, the members of the team share a passionate desire to produce world class wines reflecting the essence of their regions. 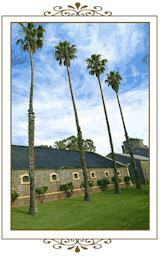 It is home to two of Australia's most outstanding wine brands, Step Rd and Beresford. 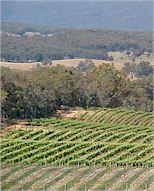 Established as a premium wine grape producing region as far back as 1860, Langhorne Creek is one of Australia’s oldest wine regions. Situated 70 km south east of Adelaide this stunning area is surprisingly cool due to its proximity to the Southern Ocean. Made up of largely flat plains sheltered by the Mount Lofty ranges with low winter-dominant rainfall and moderate daytime temperatures. The grape quality is enhanced by deep, rich alluvial soils, washed down by floods from the Adelaide Hills over the centuries. It is renowned for its reds, in particular Shiraz and Cabernet, which show great character, style and elegance. 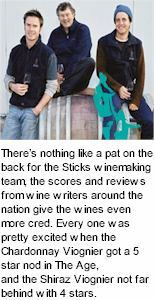 Rob Dolan’s career in the wine industry began in South Australia where he learned the art of winemaking from a couple of well-known teachers in Greg Clayfield and John Vickery at Rouge Homme. 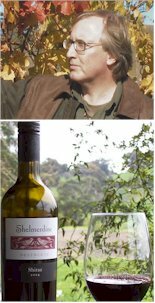 After studying at Roseworthy Agricultural College Rob began making wine in the Hunter Valley with Arrowfield and Rothbury Estate. 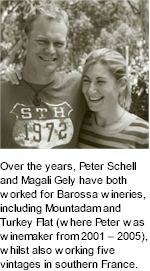 In 1991 Rob became winemaker at Yarra Ridge. Here, the opportunity of operating a small winery gave him the freedom to experiment, helping him to hone his winemaking skills. Stonehaven takes its name from one of its vineyards which originally formed part of the pioneering Hynam Station established by one of the region's first settlers Adam Smith in 1846. Stonehaven features the latest winemaking technology that provides the winemaker with unprecedented control over the winemaking process, allowing them to maximise the special characters of every batch of premium fruit that comes into the winery. Stoney Rise was started in 2000 with an eye to produce wines that are food friendly, and offer people complex wines without too much oak, or overripe fruit characters. The name comes from a surf break in the Little Dip Conservation Park behind Robe in South Australia. After 10 years in the wine industry, as a sales rep, a wine buyer, and more recently working in wineries it was time for Holyman to make the break and do something on his own. 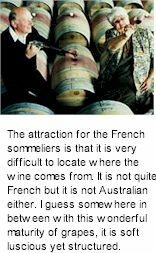 Holyman spent time working in New Zealand, Portugal and France, as well as Tasmania, Mt Benson and Coonawarra, which has given him a broad understanding of wine styles, and how many different people make their wines. Domaine A/Stoney Vineyard is a 20ha property in Tasmania's Coal River Valley just half an hour from Hobart. Owned by Swiss-born Peter and Ruth Althaus since 1989, the vineyard is positioned in a temperate maritime climate with low annual rainfall. 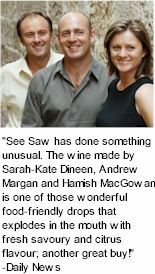 It is one of Tasmania's premier wine making estates and continues to receive accolades from across the globe. Decades later, the name Stonier is widely recognised as a producer of exceptional Chardonnay and Pinot Noir. At the heart of Stonier lies a meticulous approach to viticulture and winemaking. A desire to reflect the imprint of each site, through subtle variations in flavour and texture, interweaving these differences to form elegant wines of seamless complexity has earned Stonier a place amongst the best Pinot Noir and Chardonnay producers in Australia. 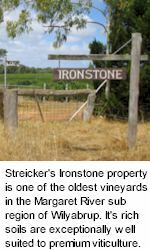 Stonier sources Chardonnay and Pinot Noir from over 150 acres across 5 selected sub-regions; Merricks North, Balnarring, Tuerong, Red Hill and at the estate vineyards in Merricks which span over 50 acres. Located in Central Victoria, Sugarloaf Creek Vineyard is situated on the boundary of the three geographical regions of the Upper Goulburn, Goulburn Valley and Macedon Ranges wine regions. The vines are non-irrigated and produce low yields of premium quality fruit. The location of the property ideally provides for cool climate viticulture leading to a long and slow ripening period for the fruit. The aim is to combine best practise viticulture with best practise wine making to consistently produce a Shiraz of outstanding quality that can sit comfortably on the international stage. 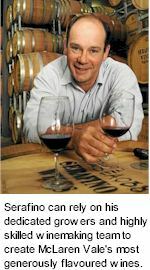 Ian Summerfield took a keen interest in Henning's activities, and in 1969 that land was planted with Taltarni's first vines. Consequently to this day, the Summerfield vineyard shares its borders with the Taltarni estate. 1970 heralded a decade of great change for many Australian families, and for the Summerfield clan, it was a watershed year that welcomed a new era.